Bianchi USA has a reputation for making some seriously competitive road racing bikes, but is often overlooked for mountain bike and cyclocross racing models. With the heritage of the Gewiss-Bianchi mountain bike team in Europe, we’ve taken aim at the Cross Country race circuit with the 2009 SOK SRAM 29r. 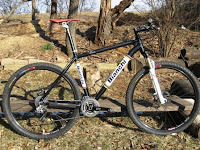 For 2009, Bianchi’s top level 29r has received a parts and frame change. (note: the bike in the following photos is my personal ride and some parts have been changed from stock; such as the stem, handlebar, saddle and headset) The new frame design provides more muscle; strength, pedaling efficiency, and agility. This design is benchmarked by Bianchi’s use of 7000 grade, hydroformed, triple butted aluminum. The process of hydroforming has been used extensively over the years on our road bikes with much success. The end result is a well tuned frame, stiffer bottom bracket region for better efficiency/faster acceleration and sharper steering. The curved downtube is an immediate sign of a new matrix as well as the hydroformed ‘pinched’ top tube shape that leads up to the headtube. The vertical dropouts are new too, as is the semi-integrated headset. Three frame sizes are offered, 17, 19, and 21 inch. 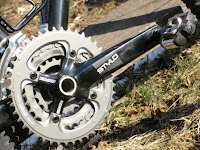 The component package has been kicked up a notch with the introduction of SRAM X.0/X.9 for 2009. The X.0 Black Box rear derailleur adds touches of class to the drivetrain along with the graphically matching Stylo crank and handlebar. Taking advantage of SRAM’s parts bin, you’ll notice full support with compatibly-engineered Avid brakes, Truvativ stem/bar, Truvativ crank, and WTB wheels, tires, grips, and saddle. Faster shifting and more style to boot! 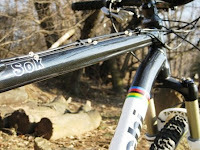 Rock Shox’s new Reba SL fork graces the front of the bike. New for 2009 are 32mm uppers adding a bit more stiffness in the fork. Stock on the handlebar, you’ll notice is the fork’s PopLoc remote. The tune-ability of the SL fork makes this a competitive component on any bike. Dual Air (upper and lower air chambers), PopLoc - Compression Lock Out with Threshold Adjustment and Rebound can be tuned to your liking. The balance of SOK SRAM is unbelievable; meaning that the front to rear weight bias feels 50/50 when changing direction with the Stylo handlebars. This high level of steering input is due in part to the frame’s stiffness at the front triangle. Out of the saddle efforts are greeted with rocket propulsion and secure traction. And when your speed gets above 12mph, the bike is a freight train. The speed is amazing as it charges over small roots and rocks. 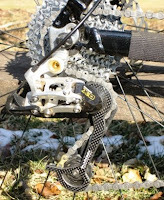 If you pedal the SOK like a road bike, it will roll like one. The profile of the WTB Exiwolf tires on the AM rims have a nice transition on the trails from corner to corner. With a larger tire footprint than a 26-inch wheel, traction in the turns is greater, as well as climbing traction due to the higher approach angles of the 29 inch wheels. On double track trails, be sure to activate the PopLoc remote; firming up the Reba SL to reduce the amount of bobbing in the front end. 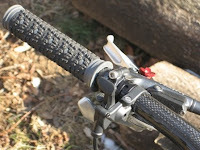 In case you forget to release the Pop Loc, there is an adjustable blow- through threshold circuit in the fork. Just pull down on the rebound adjuster in the bottom leg revealing a handy hex key to adjust the threshold on the top right assembly. Consult the Rock Shox manual for further set up details. Avid’s Juicy Seven brakes are easy to adjust to the rider’s reach and power. The pad contact adjuster is a twist away allowing you to dial in the point where the pads make contact during the brake lever’s throw. Something worth mentioning: the past few years at the Mid-Atlantic cross country/24 Hour Endurance races, more than ¾ of all the hardtail racers that are lining up at the starting line are on 29rs. We at Bianchi have developed a very affordable, out of the box race bike. Retailing at just over $2k, this is a bike that needs very few upgrades to make it a competitive, durable race machine. The larger wheels on a 29r are comparable to having a 1 inch travel dual suspension frame. The name SOK? Italian for ‘stump’! Comfort, speed and traction all in one package.